We’ve seen some bad blisters caused by burns in our time but nothing tops this one, which is so enormous it covers this poor lad’s entire palm. And, as if the sight of this monster wasn’t already grim enough, wait until you see it getting popped. As is the done thing nowadays, when this patient visited the hospital to get his NOPEworthy injury seen to, he filmed the moment it was taken care of. The footage shows the somewhat sadistic doctor (“I couldn’t resist”) squeezing the humongous yellow skin beast, causing a jet of fluid to spray out. Grim! 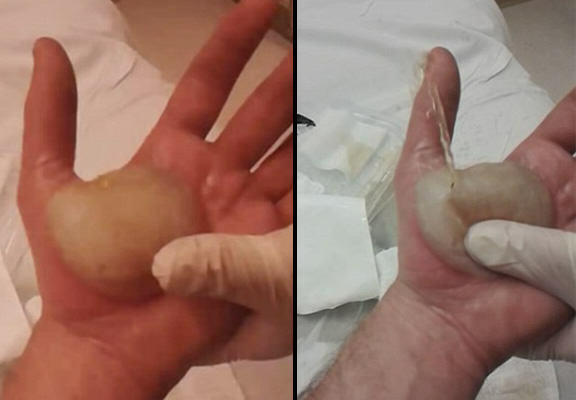 In the video, the unidentified man – known only as ‘The Most ProNoob’ on YouTube – explains that he suffered second degree burns to his palm which is how he wound up with the nasty injury. After popping the blister, the doctor cuts away the dead skin using scissors and gives everyone watching the clip nightmares for the foreseeable future. Please don’t try any of this at home!